Our traditional Saturday morning breakfast of fried eggs on an English muffin is perfect, but it’s not that easy to pull off for more than two people. 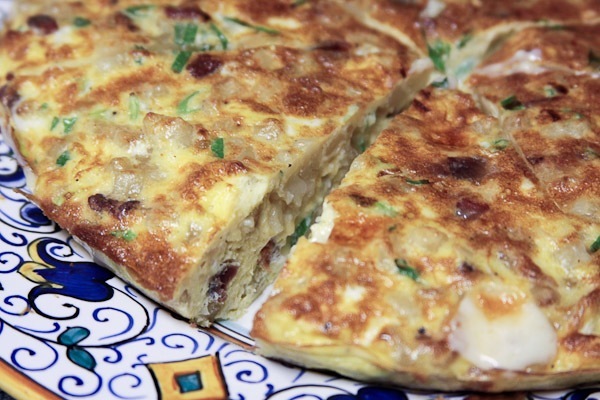 So, if you’re having people over for breakfast or brunch, try baked eggs or a frittata. We knew we’d be busy in the morning preparing breakfast for BOTH sets of parents, so we decided to cook the potatoes and bacon the night before, which allowed us to focus on the eggs and coffee in the morning. The potatoes and bacon need to cook nice and slow on low…so it was a good thing we did it the night before. Let both cool completely before putting them in the fridge (in separate containers) so that they don’t get soggy. The green that you see in the photos are scallions–added for a little extra flavor. This was our second foray into frittata making, and it turned out delicious! We definitely found a winner in the flavor/taste category! Bacon-Potato-Cheddar–what is not to like? Adjust oven rack to upper-middle position, about 5 inches from heating element; heat broiler. Whisk eggs, half-and-half, 1/2 teaspoon salt, and 1/4 teaspoon pepper in medium bowl until well combined, about 30 seconds. Set eggs aside. Fry bacon in 12-inch nonstick oven-safe skillet over medium heat until crisp, about 9 minutes. Using slotted spoon, transfer bacon to a paper towel-lined plate; pour off all but 1 tablespoon of bacon fat. Add potatoes to skillet and cook, stirring occasionally, until golden brown and tender, 15 to 20 minutes. Stir cheddar, scallions, and bacon into eggs; add egg mixture to skillet and cook, using spatula to stir and scrape bottom of skillet, until large curds form and spatula begins to leave wake but eggs are still very wet, about 2 minutes. Shake skillet to distribute eggs evenly; cook without stirring for 30 seconds to let bottom set. 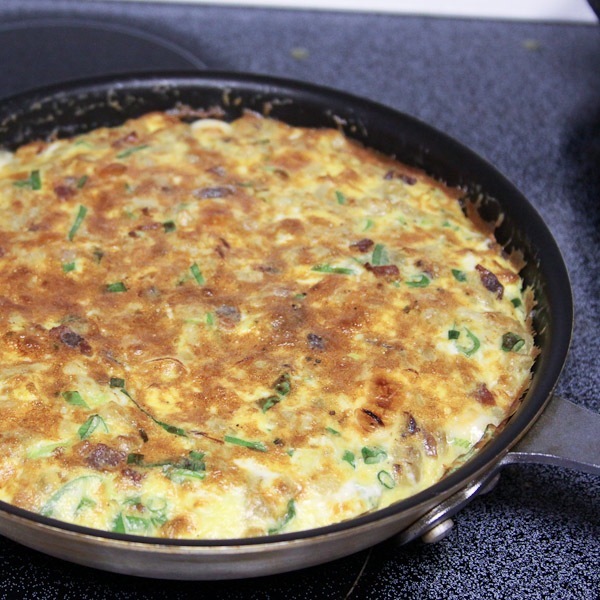 Slide skillet under broiler and broil until frittata has risen and surface is puffed and spotty brown, 3 to 4 minutes; when cut into with paring knife, eggs should be slightly wet and runny. Remove skillet from oven and let stand 5 minutes to finish cooking; using spatula, loosen frittata from skillet and slide onto platter or cutting board. Cut into wedges and serve. These look great! I’ll be trying them tonight with the fam. About how many does this recipe serve? Any suggestions on a possible way to reheat leftovers? This recipe should eaily serve 4 – 6 people. I like reheating slices in the toaster oven. It keeps and reheats really well. I guess it’s safe to put the All-clad nonstick under the broiler? I can never remember, but your pic looks like that’s what you used. Hi Jen, you can definitely get away with just finishing it in the oven instead of under the broiler. Since it starts on the stove, it will get nice and brown from that. It is a non-stick pan, but definitely not All-Clad… it is much more budget. Probably not the best thing in the world for it, but you do have it a bit away from the heat. Good Luck!